19 August in High Point NC. If your group would like to host "Hummingbird Mornings" anywhere in the U.S. or Canada in 2006 or later, click on the link above for more info or contact Bill Hilton Jr. When early August arrives at Hilton Pond Center, our trees and shrubs have unfurled about all the leaves they will produce for the current growing season, so right now we're blessed with our yearly maximum of shade. A walk down most of our sylvan trails is pleasant even when the noontime sun is high; we're more than a little grateful for the canopy of green overhead. The big disadvantage of shady trees is they block out so much sunlight that lots of ground-dwelling forbs and wildflowers can no longer make a living, and many wither and fade away until next spring when still-leafless trees allow essential sunlight to strike the forest floor. Right now, however, any plant with blooms is almost certain to be growing out in the open--either on roadsides or exposed pond margins or within one of the mini-meadows we maintain around the Center. In such situations, odds are the flowering plant is one of our "early August composites." 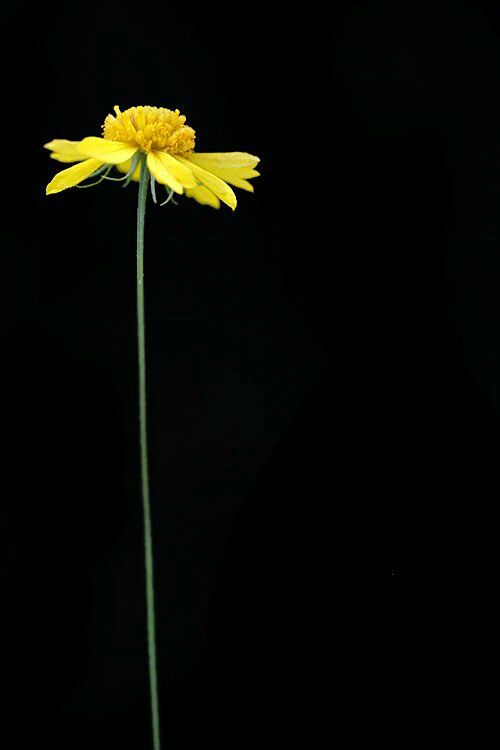 A composite is a plant whose flower is roughly star-shaped (hence the in-vogue family name "Asteraceae"), and whose blossom is actually made of two different kinds of flowers (hence the old, out-of-fashion family name "Compositae"). 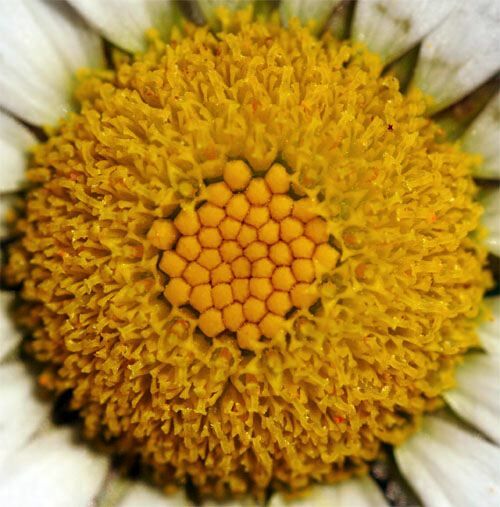 There's little doubt the Oxeye Daisy, Chrysanthemum leucanthemum (above), qualifies as star-shaped, but we have to look a bit closer to see that it has actually bears two different flower types. 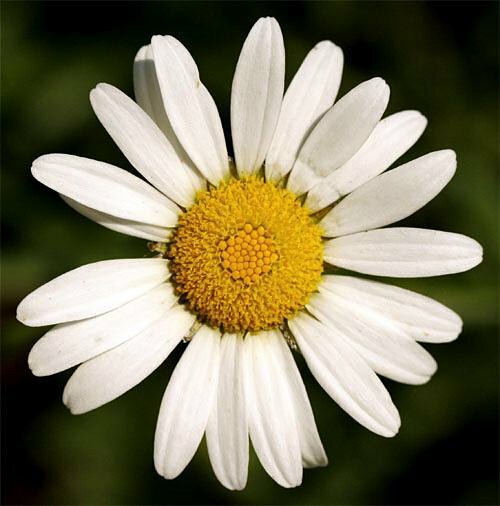 In a daisy, the white loves-me-loves-me-not "petals" are actually one of the flower types--inch-long sterile "ray flowers" unable to produce seed but that serve the valuable function of advertising the flower head and attracting potential pollinators. 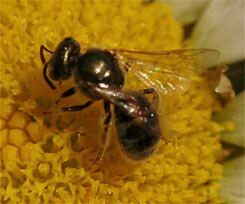 Some ray flowers even have ultraviolet lines--invisible to us humans but quite obvious to insects; these so-called "bee guides" point the pollinator toward a dense array of "disk flowers," the reproductive part of the inflorescence at the center of the flower head. 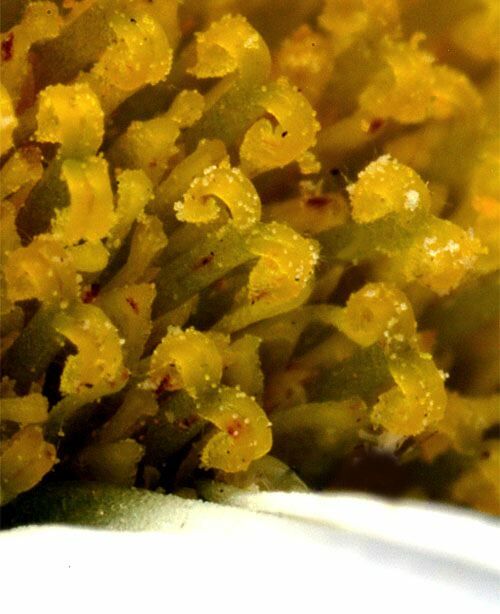 A close view will show an Oxeye Daisy's one-inch central disk is made of hundreds of these disk flowers (above, some unopened), each less than one-sixty-fourth of an inch wide and made up of miniscule petals, pollen-producing stamens, and a pistil (6:1 photomicrograph below). 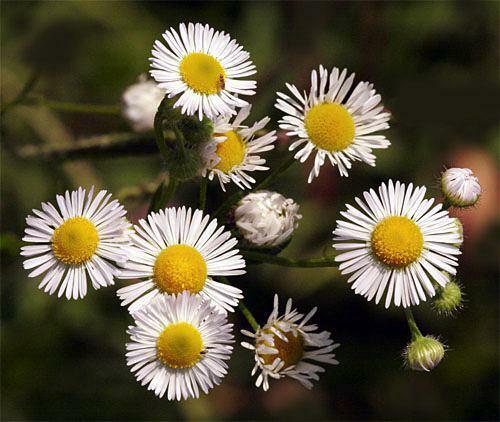 One composite flower many folks mistake for Oxeye Daisy is Daisy Fleabane, Erigeron sp. (below), which is only about three-fourths of an inch across and with many more ray flowers than a true daisy. 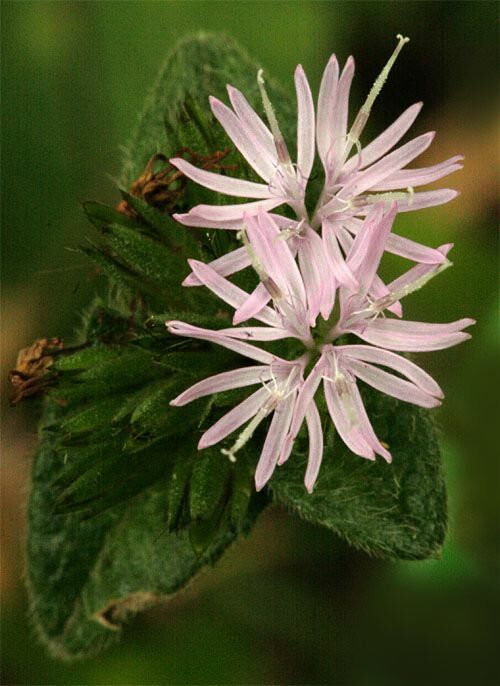 This relatively common roadside and meadow plant--there are half a dozen species in the Carolinas--has ray flowers that vary in hue from pure white to pale pink to dark lavender. Some individuals are more shade-tolerant and--in our experience--tend to have more intense coloration, but no matter the color there's no doubt all are composites. Many composites have long, tall stems (below) that put their flowers above the surrounding grass and make them more visible to pollinators. Bees, wasps, flies, beetles, true bugs, and a variety of other insects are attracted to the long, showy ray flowers and alight on them before moving to sample nectar from the central disk. A composite's ray and disk flowers often combine to form a large, round platform, as illustrated below, where pollinators seek nectar and even find mates. Insect visitors should beware, however, since Flower Spiders often lie in wait to ambush and kill unsuspecting prey before sucking them dry of their nutritious bodily fluids. We even once found a six-inch Carolina Anole lizard hiding on a composite flower stalk, no doubt in anticipation of some juicy insect luncheon fare. Composites do come in hue other than white or yellow, of course, as shown by several Carolina species of Elephant's-Foot, Elephantopus sp. (above). This native wildflower is doing well at Hilton Pond Center, where stems with pale purplish flowers rise from broad, flat leaves that give the plant both its common and scientific names. One curious asopect of this particular composite is that an Elephant's-Foot flower head is made up entirely of disk flowers, each only about an eighth of an inch tall. Although composite flowers such as those around Hilton Pond this August are indeed diverse, when most folks think about composites, they think about sunflowers--the quintessential composite with a huge central disk that produces seeds we use to attract songbirds to our feeders. 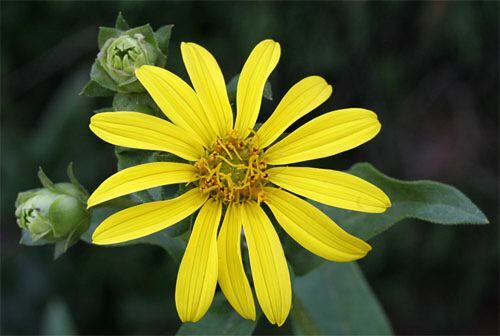 Those particular sunflowers are undoubtedly hybrids bred and refined for maximum seed production, but a plethora of smaller native sunflowers can be found throughout the Carolina Piedmont. Unfortunately, most of these are DYCs, so we haven't a clue as to the species of the roadside sunflower pictured above. Fortunately, we still have a few late-blooming Oxeye Daisies left over from their usual spring/early summer flourish, so these, the Elephant's-Foot, and Daisy Fleabane keep us from feeling completely inept at Hilton Pond Center when it comes to identifying DWCs and a few other early August composites. For the first time, Hummingbird Mornings programming goes to Gibson Park in High Point NC, hosted by Liz & Tom Schmid of the Wild Birds Unlimited store. On Saturday, 19 August 2006 we'll have two 90-minute presentations at 8 and 10:30 a.m., both of which are free and open to the public. We'll capture and band live Ruby-throated Hummingbirds and share lots of interesting info about hummingbird natural history and how to attract these amazing little creatures to your own backyard. Admission is free, but advance registration is required. Details and directions at Hummingbird Mornings. --We continue to be below the norm for banded Ruby-throated Hummingbirds in 2006 here at Hilton Pond Center. Through 14 Aug we had captured 67 RTHUs--84% of where we normally would be by that date, based on 23 years of banding. --The 2006 Land Between the Lakes Hummingbird Festival at the Woodlands Nature Station in western Kentucky was a big success, as always. Over the weekend about 1,100 hummer enthusiasts attended our banding demonstrations and lectures. Next year's Festival again will be held the first weekend in August (3-5), so make your travel plans now to see hundreds of RTHUs and learn from booths and exhibits developed by a staff that's about the most pleasant bunch of folks with whom we've ever worked. If you can't get along with THEM, you can't get along with anybody!